LizardSales is a browser add-on that inserts commercial and non-commercial offers into various websites in order to enhance your online behavior. As the name of the program suggests, it is aimed at helping you find the best online deals and sales. However, the program is quite obtrusive because it displays coupons, web banners, and other advertisements on basically every website you access. It is known that the program used to be promoted at lizardsales.info; however, the website is no longer active. It means that the program is distributed in other ways; one of which is bundled downloads. If you want to prevent advertising-supported programs, you should keep the operating system protected and pay close attention to every installation process in order to get a chance to decline unwanted programs. LizardSales is based on the JustPlugIt browser add-on creation engine which is well-known to our researchers because they have recently been analysis many identical programs based on this engine. 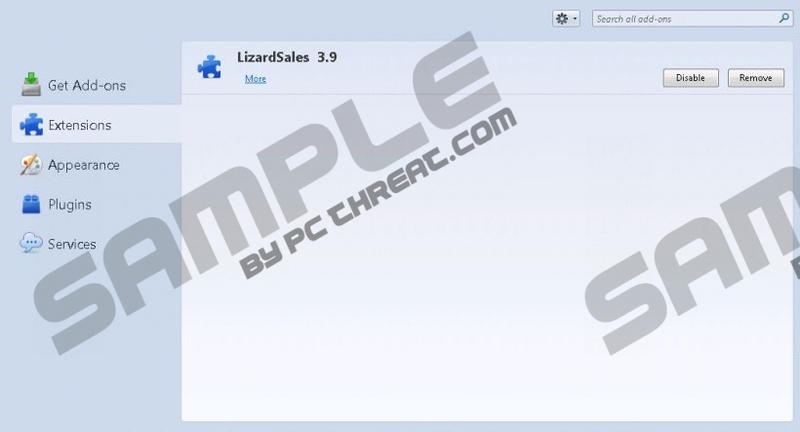 Like other JustPlugIt programs, LizardSales is distributed by the Installrex installer. It is very easy to get deceived because the Internet is full of deceptive offers that are displayed on unreliable websites. For example, if you like browsing file sharing websites or some adult-themed websites, you may find pop-up windows inviting you to download a program, take part in a survey or contest, etc. It is crucial to ignore such offers because some insecure programs may be installed without your permission, which is regarded as an instance of drive-by-downloading. The LizardSales program does not have a very high detection rate, but some computer users complain about this program. If you are one of them and want to get rid of its pop-ups, do not wait any longer. Below you will find our instructions that should help you remove the program. You will have to uninstall the program and remove the browser add-on of LizardSales from Mozilla Firefox. However, it is also important to check whether all the files of the program are deleted, not to mention the checkup of the overall system. We recommend that you rely on a powerful anti-malware program so that you can be certain that you can browse the Internet safely. Our team recommends using SpyHunter, which is a powerful malware and spyware removal tool. This program easily eliminates JustPlugIt programs, not to mention various Trojan horses, ransomware infections, browser hijackers, adware, rogue anti-virus programs, rootkits, and many other threats. Click Ctrl+Shift+A and click Extensions. Quick & tested solution for LizardSales removal.